I’m going to ignore any comments about DevOPs being a vague term like Cloud which means different things to different people. To me it means trying to use tools and alternative project management approaches (Agile) to deliver repeatable things (applications/networks/virtual servers/physical servers) and continue to manage the configuration of those things after you’ve deployed them (not just running away). 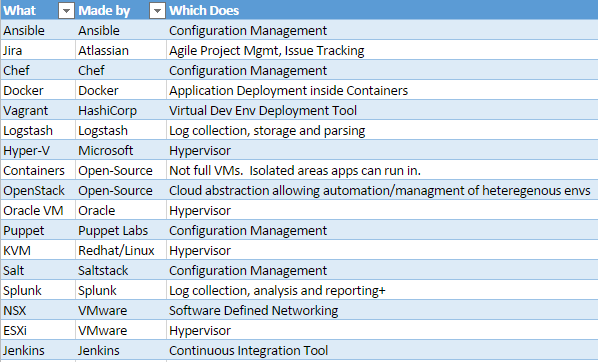 At work I have recently started working more closely with our SDDC team there is plenty mention of a number of these tools and even the project management methodology of iteratively attempting small chunks of a project is new and interesting. It’s sometimes hard not to slip back into old habits of meetings straying into chats, but breaking projects down into very specific/atomic tasks makes ownership clearer and status. Either something is done or not done, it can’t be waiting on the next person. If it is for them to do then it’s a task in their queue. (This is a variation on the Harvard Business idea of Who’s Got the Monkey https://hbr.org/1999/11/management-time-whos-got-the-monkey). Upgrading your HomeLab to Windows 10 + VMware Workstation ? ?